The Reverend Jeffrey Colarossi called us with a simple question: how did his family become Presbyterian? Jeffrey is a minister at the United Presbyterian Church in Pottsville, Pennsylvania . His great-grandfather Pansilo Puglieli immigrated from Italy to the United States circa 1900 and settled in the town of Caraopolis, near Pittsburgh. From checking printed resources in our reading room we learned there was an Italian Presbyterian Mission in Caraopolis at the turn-of-the century. A subsequent call to Eleanor Colarossi, Pansilo’s granddaughter and Jeffrey’s mother, turned up extra information—not only about the mission, but also Pansilo. According to the Works Progress Administration’s Inventory of Presbyterian Churches in Pennsylvania (1932), Rev. Pastore organized the Italian Presbyterian Mission in 1907 with the aid of the Presbytery of Pittsburgh. Eleanor told us that the mission attracted many of the town’s Italian immigrants for one overwhelming reason: it provided services in their native tongue. Each Sunday the mission met at the Second Presbyterian Church, holding morning services in Hungarian and 3pm services in Italian. Although Presbyterianism has its roots in the British Isles and is commonly perceived as a religion practiced by individuals of Scotch-Irish descent, Presbyterian denominations in America have a long history of outreach to a diverse array of ethnic communities. As early as the 1850s, the Old School branch of the Presbyterian Church in the U.S.A. (PCUSA) started proselytizing the Reformed faith to new immigrants. According to Presbyterian Panorama by Clifford Drury , the Board of Home Missions of the PCUSA (Old School) had 14 missionaries working with foreign-born immigrant communities in 1856: 10 German, 2 Welsh, 1 French, and 1 Italian. Over the next seventy years the denomination increased its missionary efforts in response to increased rates of immigration to the United States. By 1922, the PCUSA had 100 churches and missions nationwide serving Italian immigrants alone, with a total of 6,173 members, as well as 560 churches and missions serving additional immigrant groups—including Slavic, Hungarian, Portuguese, Asian, Armenian, and Latino communities—with a total of 48,731 members. In the South, the Presbyterian Church in the United States (PCUS) greeted new arrivals with a similarly robust outreach effort. Through its Executive Committee of Home Missions, the PCUS also ministered to underserved minorities of longer standing, such as Native Americans, African Americans, and Mexican Americans. (In 1890, the PCUS Synod of Texas established the first Mexican Presbyterian church in the state at San Marcos; in 1912, it founded the Texas-Mexican Industrial Institute in Kingsville  with the aim of training Latin American ministers.) 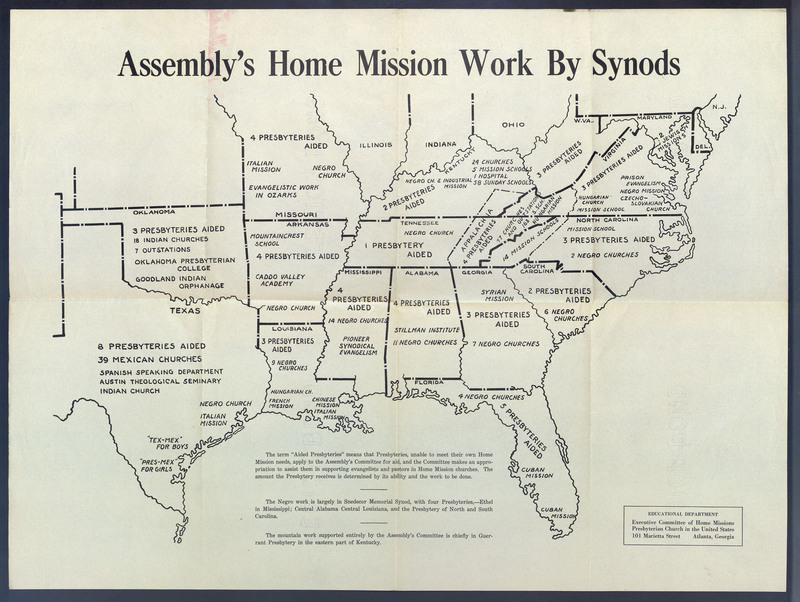 The Executive Committee of Home Missions worked in some of America’s largest cities, conducting outreach to Cubans in Tampa, Italians in Kansas City, Jews in Baltimore, and Chinese in New Orleans. Today, the Presbyterian Mission Agency of the Presbyterian Church (U.S.A.)  develops Presbyterian communities of faith among new immigrants, including Koreans, Cambodians, and other growing ethnic groups. Additionally, the Presbyterian Church (U.S.A.) is engaging in alternative methods of worship to build 1,001 Worshiping Communities  in ten years. As the PC(USA) expands its outreach efforts in these and other ways, it is fortunate to have such a long tradition of missionary work to draw from, and families such as the Colarossis to help connect it with that past.